Sofie Ramos inside her installation. Through March 11. Free. Johansson Projects, 2300 Telegraph Ave., Oakland. JohanssonProjects.com. When you’re a child and the lights get turned out, all the objects in the room transform, augmented by their massive shadows into items suddenly absurd and bloated. Sofie Ramos’ Pathways / In and Out is like this — except brightly lit, in a full palette of colors, so that all the eeriness falls away. The immersive installation currently at Johansson Projects gallery is joyous and playful. 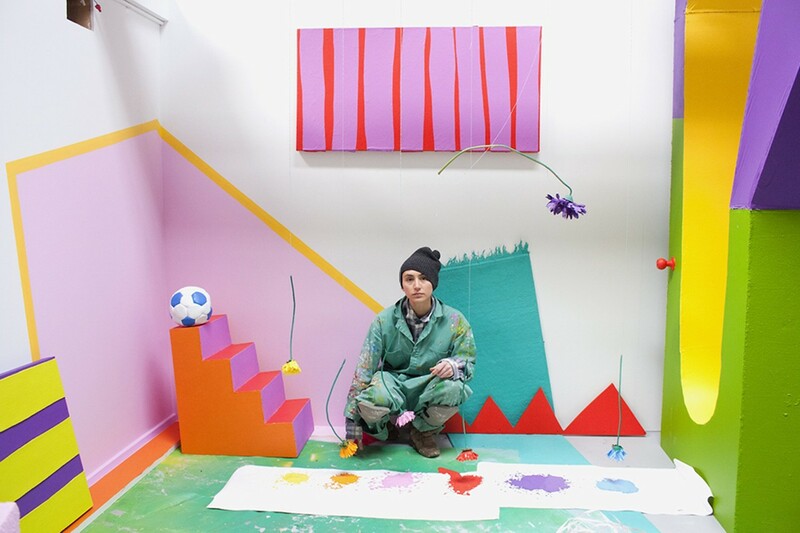 Painting directly onto the walls and floors to cohesively supplement her simple geometric sculptures, Ramos creates the feeling of walking into a painting. It’s never clear where one piece ends and another begins, and the architecture of the gallery itself appears equally warped. In a political climate that feels perpetually gloomy, Pathways is an absolute delight.